Boeing supported the launch of an unarmed Minuteman III intercontinental ballistic missile at Vandenberg Air Force Base on Sept. 23, 2014. VANDENBERG AIR FORCE BASE, Calif., Oct. 29, 2014 — Boeing [NYSE: BA] supported the U.S. Air Force’s successful flight test of a Minuteman III intercontinental ballistic missile (ICBM), which demonstrated the readiness of that system to deter nuclear threats. The unarmed ICBM launched Sept. 23, 2014, from Vandenberg Air Force Base and reached a target in the Kwajalein Atoll during the test. Boeing first partnered with the Air Force in 1958 to design, assemble and test the Minuteman system. Boeing is the original equipment manufacturer and provides repair, maintenance and testing services at facilities in Utah and Ohio. 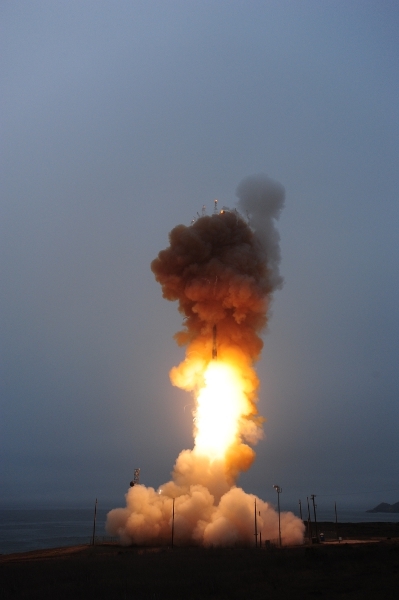 “It’s essential for the U.S. Air Force to have confidence in the capabilities of Minuteman III and in Boeing’s abilities to sustain the ICBM force,” Morse said.